Well it has certainly been a little longer than I'd like between posts! I hope you are doing well and enjoying SALE-A-BRATION and the Occasions Catalog! There are some really fun things packed in those publications! Just like our Annual Catalog too! I hosted my first real Class in the Studio in I was diagnosed with breast cancer. It felt SO GOOD to be creative and to get back to hosting a full class with a room full of stamping customers and friends! 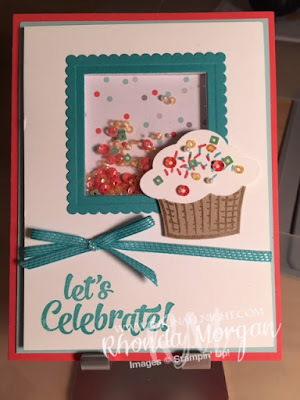 I had purchased some items awhile back from the clearance rack in a few of my favorite colors and they were always intended to be used in a Birthday Card Class! I had saved a few favorites from Pinterest and Blogs and just started by recreating a couple of cards just like they were, others became a starting point and then I modified them to make them fit what I was using. Here is one of five Birthday Cards from my Friday night Birthday Fun Class!! 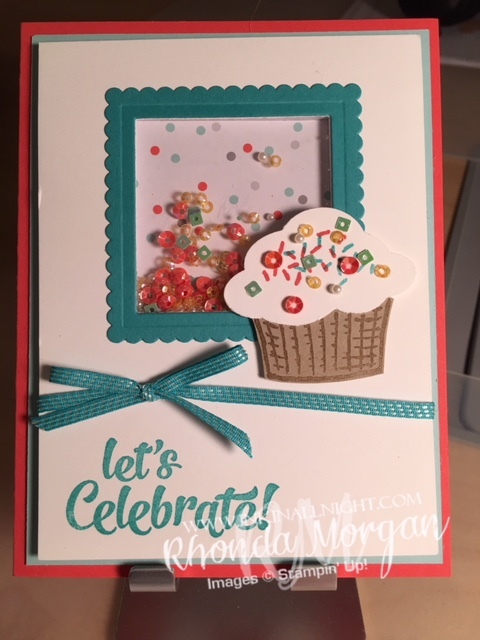 A fun shaker card that features the Sprinkles of Life and Confetti Celebration stamp sets! Color combination includes Bermuda Bay, Pool Party and the fabulous retired Watermelon Wonder, with a touch of Crumb Cake.